Oregon Hollygrape. Berberis aquifolium Prursh. Oregon grape, Rocky Mountain grape, hollyleaved barberry, California barberry, trailing mahonia. This shrub is native in woods in rich soil among rocks from Nebraska to the Pacific Ocean, but it is especially abundant in Oregon and northern California. Oregon hollygrape is a low-growing shrub from 2 to 5 feet in height, resembling the holly of the Eastern States. 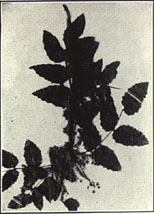 The leaves are divided like those of an ash; the five to nine leaflets from 2 to 3 inches long and about 1 inch wide are evergreen, thick, leathery, smooth, and shining on the upper surface with marginal spines. The numerous small yellow flowers appear in April and May and are borne in erect clusters. The fruit consists of a cluster of blue berries. The rootstock and roots are more or less knotty, about an inch or less in diameter, with tough yellow wood and brownish bark. The roots of Berberis nervosa Pursh, which is found in the same region, are sometimes collected with that of Oregon hollygrape. The bark, collected in autumn. prev: Narrow Dock. Rumex crispus L.
next: Peppermint. Mentha piperita L.